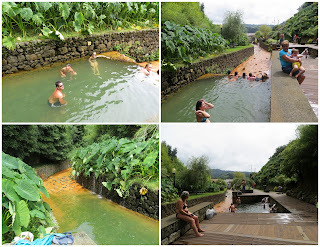 One of my favorite day trips during my vacation in the Azores was to a town called Furnas. 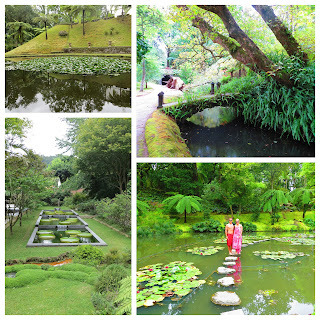 Furnas is an incredibly unique place due to the fact that there is volcanic activity occuring near the surface of the earth! Now, I'm not saying that if you were to visit Furnas you would be at risk of experiencing an explosion, BUT you do have to be careful where you step because there are small pools of naturally boiling water all over the place! As my boyfriend so eloquently put it, the boiling water was simply "the earth breathing." There were several spouts which allowed you to give naturally "carbonated" water a taste. It wasn't horrible...but I'll take a Poland Spring over that stuff any day. Because of the minerals coming from the earth the water also had a slightly sulfuric taste. Large bags of ears of corn were placed right into the boiling water to cook, and then sold at nearby stands. Corn on the cob is one of my favorite foods so obviously I couldn't pass it up. It was delicious. 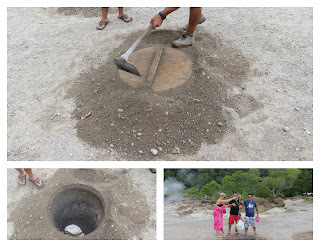 Near the Lagoa das Furnas (Lake of Furnas) there was an area that was sprinkled with small pits built into the ground. I was informed that people put together large pots of food at home, containing various meats and veggies. 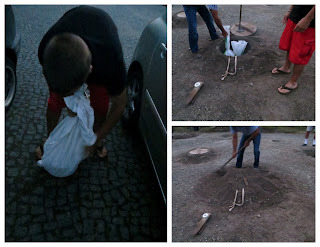 They then bring the pots, all wrapped up in a towel, to Furnas. 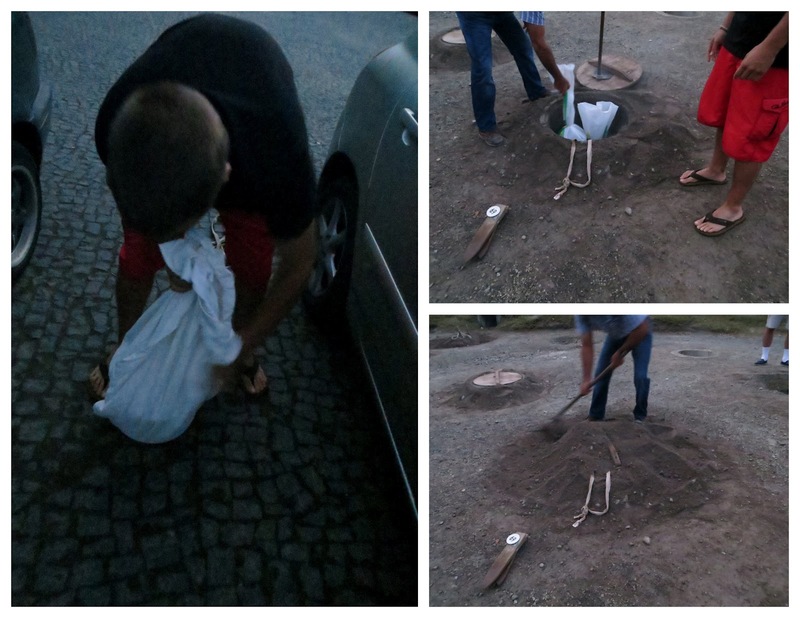 The pot is placed within a pit early in the morning (think 6:30 a.m.) and left for 6-8 hours to cook, thanks to the heat underground. I was amazed by this, and decided that I simply had to try it for myself. I had no idea where to begin so I enlisted the help of a couple girlfriends I made on the island. Luck was on my side because one of the girls happened to be a butcher and she hooked me up with chicken, 2 types of sausage, and 2 cuts of pork, and a huge cut of beef. All that meat, along with a head of cabbage, potatoes, carrots, and salt were thrown into the pot. 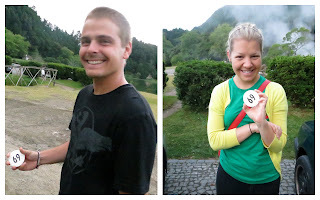 The next day, my boyfriend and I woke up before dawn (ugh) and drove with our sacred pot of goodies to Furnas. We gave our pot to the most official-looking man in the area. He placed the pot in the bottom of one of the pits, placed the lid back on, shoveled some dirt on top of it, and gave us a number so we would remember where our pot was. Because both mine and my boyfriend's minds are way down in the gutter, and the fact that we were so loopy and up before the sun, we found our assigned number quite hilarious. 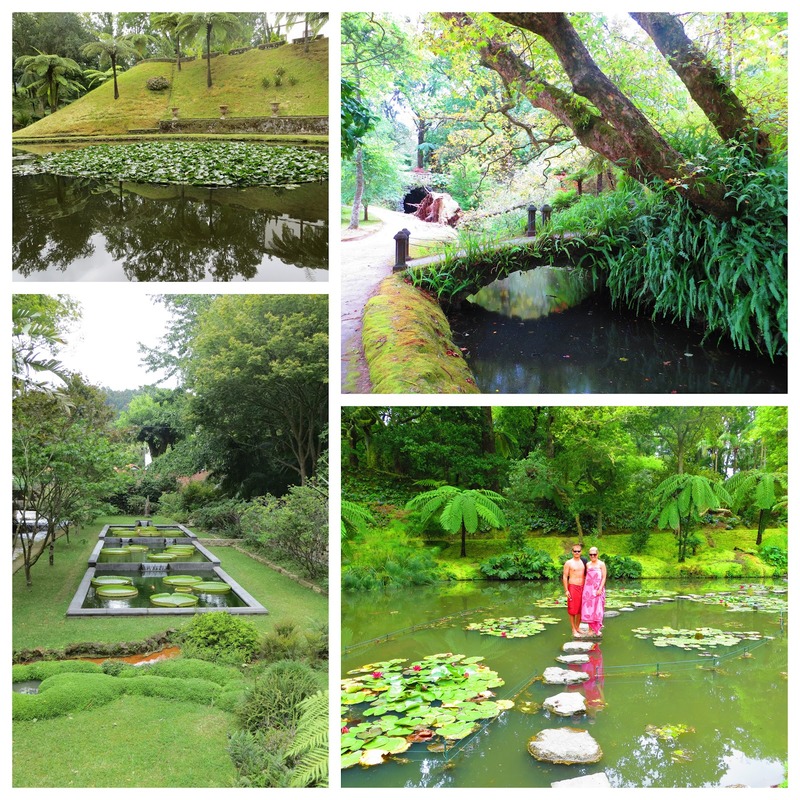 Since we had about 8 hours to kill before lunch would be ready, we decided to go around and enjoy the sights that Furnas had to offer. 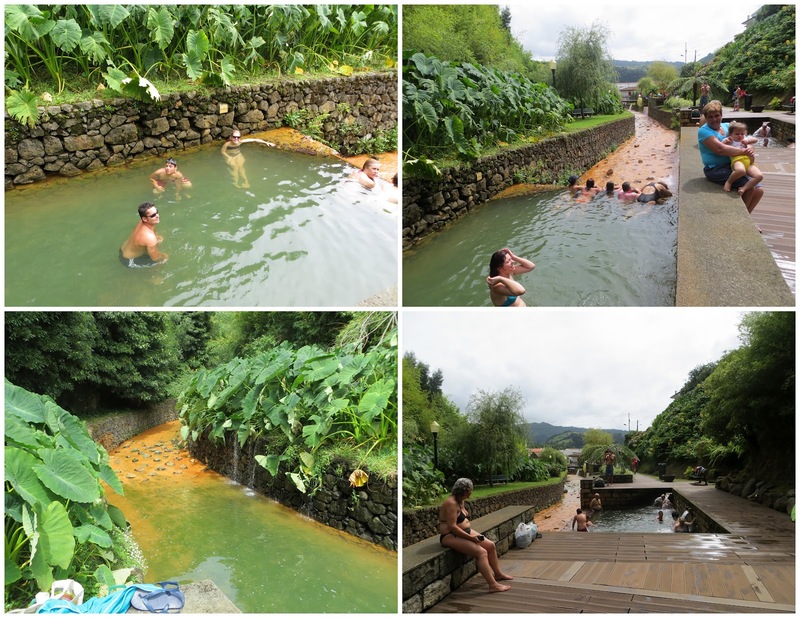 Our first stop was a natural hot spring. The water came up from beneath the earth's surface at a steamy hot-tub temperature. 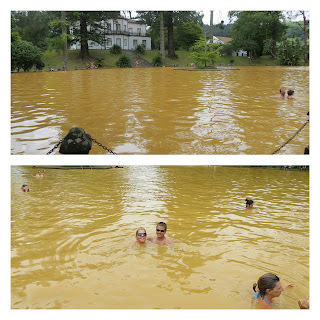 It is said that this water is very good for your skin because it is full of minerals. Many people rubbed the minerals from off the rocks and directly onto their faces, arms, etc. Our next stop was another hot spring, this time the water spilled directly into a gigantic pool. It was in a park called Parque Terra Nostra. It was a gorgeous estate with a sprawling garden containing plants, trees, and flowers from all over the world. A huge mansion overlooked the pool. The water was a murky-yellow color because of the minerals. At last! It was time to pull up our pot for lunch. We handed in our number, the dirt was shoveled off our pit, and we pulled up our lunch. Team effort! We set up our "picnic" at a nearby table. Of course a Portuguese lunch is never complete without wine and bread, so we made sure to bring those from the house. 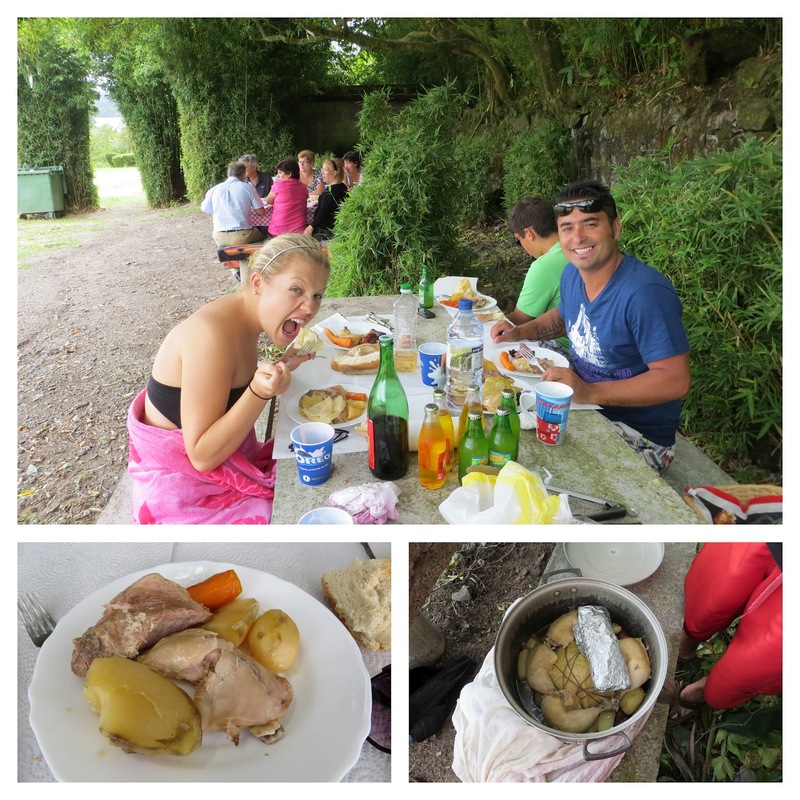 The food from the pot was more delicious than I ever expected; the meat was tender and juicy, the vegetables were cooked to perfection and so flavorful. By far, our day spent in Furnas was one of my favorites from the vacation.